Every study prepared and commission report issued on the decline of housing affordability identifies regulation (e.g., low density zoning) and other delays in obtaining development permits as primary culprits. What we see across the country is widespread concern, particularly in suburban and rural communities, over the potential problems of environmental degradation, worsened traffic congestion, increased property taxes for schools and the cost of infrastructure expansion, and loss of open space. Responding to citizen concerns — and sometimes having development proposals rejected because of them – – does add to the cost of housing development. But, what must be understood is that even should such “anti-growth” resistance be substantially reduced, housing will not become more affordable without other very specific public policy changes. A brief examination of how communities develop reveals why even the potential for changes in regulation will exacerbate rather than help make housing more affordable. The earliest suburban communities spread out from the rail lines linking those communities with the urban center. As public infrastructure was extended beyond the cities, farmland became increasingly more developable for residential, commercial or industrial use. Developers and land speculators bought out many farmers (who often took their profit in increased land values to purchase much larger farms in more distant locations). The developers obtained approval for large subdivisions of homes, and the speculators waited for the price of land to rise ever higher. Beginning in the 1950s, state and Federal subsidies for highway programs expanded accessibility into areas not served by “mass transit.” New communities sprang up seemingly overnight; and, because many speculators continued to hold their sites off the market, development was forced to more and more distant locations — absorbing farmland and open space. During the 1950s and 1960s, the cost of suburban land for housing, although increasing, was still relatively inexpensive; and, people wanted space between themselves and their neighbors — a luxury few enjoyed as city dwellers. As a result, minimum acre or lot size zoning was adopted to protect the character of suburban communities. Ironically, a secondary reason for this type of zoning was to reduce the potential for overdevelopment. However, as vacant land disappeared (or was being held for speculation), the price of land was driven up considerably and developers were forced to ever more distant farming areas to find land on which they could build houses people could afford. The tendency for land to increase in value does have limits. Widespread unemployment and recession cause land values to fall like a house of cards hit by a stiff wind. Even when economic conditions are favorable, land prices are subject to downward pressures that include the household income of potential homebuyers, the market rate of interest charged by lending institutions for mortgage loans, the costs associated with actual construction of housing units, and the impact of public policies such as zoning and taxation. When a developer makes an offer to a farmer, speculator or other landowner for a site, zoning and other development costs are important components in determining the maximum price that can be paid while still looking forward to a reasonable profit. If land prices are rising and the present owner is under little financial pressure to sell, the developer may be forced to pay much more than the development plan can absorb. One way to change the financials is to apply for a zoning variance that would permit a more intensive use of the site (i.e., higher density or high-rise development). When such variances are approved, however, all other landowners will thereafter capitalize this potential for higher density development into their asking prices. Another public policy with direct and normally negative impact on housing affordability is the property tax. Most communities do a very poor job of assessing undeveloped land to reflect increases in market value. Housing, on the other hand, is heavily taxed, taking homeownership out of the reach of many families who might afford a basic mortgage payment but cannot afford the extra $100-$300 a month in property taxes. If the annual cost to landowners of holding land equated to its annual increase in value, far less land would be held for speculation and the price of land would stabilize and gradually decline. With more landowners offering their land for development, the costs associated with site improvement (i.e., bringing in streets, utilities, sewer and water lines, etc.) would be absorbed by landowners in the form of lower prices. Herein lies the key to housing affordability. We recently spoke with Edward J. Dodson, a resident of Cherry Hill, New Jersey, and a member of the Green Party and director of an online education and research project called the School of Cooperative Individualism. He is a graduate of Shippensburg and Temple universities and a contributing writer to several publications devoted to improving public understanding of political economy. Does the Green Party see a need for property tax reform? The platform of the Green Party of the United States calls for the public collection of what in economics is referred to as “Community Ground Rent”, or what a user of land would pay to lease a parcel or tract of land, by means of Land Value Taxation (LVT). This involves changing the way real estate is taxed so that housing and other buildings are no longer taxed, leaving only the value of land in the tax base of our cities, towns, townships, boroughs, counties and school districts. What is the past and present status of LVT? Some Pennsylvania communities have been slowly moving this direction for decades. At last count, 16 Pennsylvania cities (including Harrisburg, the state capital) and two school districts tax the assessed value of land at a higher rate than is imposed on building values. This gradual approach is generally referred to as the “two-rate property tax.” The results of this change in taxation are demonstrated by the Harrisburg experience as reported in PM Magazine in 2010: “In 1980, Harrisburg, Pennsylvania, was cited by the Department of Housing and Urban Development as one of the nation’s most distressed cities. It had lost 800 businesses and a third of its population in 20 years. Mayor Stephen Reed initiated the two-rate tax in that era, reducing the tax rate on buildings to one-half the rate on land. Why is this tax issue important? They can learn more about this important public policy issue by an online search on Land Value Taxation or Land Value Capture. I am happy to respond to any inquiries. Dodson can be contacted at edod08034@comcast.net. Many economists in the United States are presenting a cautiously optimistic picture of the future of our economy, conditioned in part on a gradual recovery of “housing” prices as a significant driver of economic activity. Remarkably, despite the decline in nominal household net worth attributable to declining property values, household spending increased over the summer. The number of people who feel financially secure and/or optimistic about their employment situation has infused the United States economy with a raised baseline of spending. And, with continued high unemployment comes worsening chronic poverty and increasing demands on government social welfare programs. More and more households and individuals survive only because of the government safety net and the efforts of charitable organizations. Corporate leaders in the United States seem slow to realize that household poverty is a growing threat not only to the future of our economy but to the stability of our society. When Kate O’Sullivan reported in this month’s CFO Magazine that “GDP in the third quarter grew by 2.5% roughly in line with economists’ expectations” she repeated by her absence of analysis that this increase in GDP is not indicative of the real economy experiencing growth. It is the result of government borrowing and spending. Too few economists and other analysts are raising the crucial question of where, absent fundamental tax reform, the revenue will come from to continue to pay for public goods and services. At some point in the near future public revenue will be insufficient even to service the skyrocketing federal debt. Cities look to the states for revenue, and the states look to the federal government for revenue. At the moment, the federal government looks to the Federal Reserve to create purchasing power out of thin air. This is a very dangerous game that becomes ever more dangerous with each passing day. Readers of this commentary have certainly formed their own opinions on how the current financial crisis could have been avoided. Based on my own 30 plus years working in the U.S. financial services industry*, I offer these insights about the boom-to-bust nature of our economic system and what might be done to mitigate the problems as the next cycle begins. What I learned financing real estate development and affordable housing is that credit-fueled property markets are inherently unstable and are prone to collapsing every 18-20 years. What we know is that credit acts as an accelerant, poured onto speculation-driven fires endemic to our property markets. Investors seeking high returns move financial assets from one speculative market to another: into shares of stock, into precious metals, into property, into raw land, into currencies, into mortgage-backed securities, and so on. And, of course, from the investor’s point of view, it is far better to use leverage and risk someone else’s assets in speculation than one’s own. The use of credit by investors in the property markets is normal. What was not normal in this cycle was the aggregation of externalities — most importantly the bypassing in the United States of Fannie Mae, Freddie Mac and the FHA as the gatekeepers over the quality of collateral going into mortgage-backed securities. No objective analyst would suggest that the GSEs are blameless. However, Wall Street firms with support from the bond rating agencies approved and packaged mortgage loans originated without verification of income or employment or even creditworthiness — often with fraudulent property appraisals or no appraisal required. A high percentage of these loans was originated under predatory terms and outright fraud. The high nominal yields attracted all manner of investors in an environment absent of meaningful regulatory oversight. What happens whenever the pool of potential borrowers or homebuyers expands as occurred in response to the explosion in the “sub-prime” business is that market forces capitalize the change in equilibrium into higher land (and total property) prices. Property prices were already increasing at dangerously high annual rates. The sub-prime market accelerated the cycle but with the added component of a greater level of criminal activity than previously experienced. As property prices climbed, Fannie Mae and Freddie Mac responded by raising maximum loan limits, reducing down payment requirements, extending mortgage terms, creating interest only mortgages, permitting negative amortization and offering adjustable rates that enabled people to qualify for larger loans. All of these steps involved elaborate risk assessment and concurrence by the private mortgage insurance providers. In the short run, these measures protected the GSEs from erosion of market share and kept stock analysts reasonably confident in profit projections. Those of us in the industry who saw all this developing and feared the worst observed that on a growing number of property appraisals the land-to-total value ratios were dangerously high in many markets. Only a few decades ago, the purchase of a residential property required a 20 percent cash down payment. The logic of this requirement was understood. Mortgage financing was made available for the purchase of a home; cash was required for the purchase of the land parcel on which the house was constructed. As land prices escalated beginning in the 1960s, fewer and fewer households were able to meet the traditional down payment requirement. The industry responded by accepting a lower down payment and requiring the purchase of private mortgage insurance. Here, again, market forces capitalized the increased potential pool of property purchasers into higher and higher land prices. By the early 2000s, the loans being purchased or securitized involved financing for more and more land and less and less housing. In New York City or San Francisco, for example, the land might comprise 80 or 85 percent of the total value in parts of these regions. These very high ratios were more common in transactions involving properties already improved and where existing homes were under-improvements in markets where new construction was almost universally priced beyond loan limits for the conventional market. Development firms have long employed a number of strategies to overcome high land acquisition costs. Those with sufficient cash reserves acquire land at the margins of existing communities, holding the land until demand for new housing units materializes. Or, they will attempt to secure approval to increase densities or build upward. At the level of the individual firm these strategies make sense; however, a far more effective societal strategy would be to tame our land markets so that developers are not required to tie up financial assets in land-banking operations. What is clear is that at some point escalating land prices impose unmanageable financial stress on businesses and residential property owners. At the peak of the land market cycle, the stress triggers a collapse in property markets (with bank failures, business failures and foreclosures as collateral damage). As land prices increase business profit margins are reduced by rising land acquisition costs (pushed forward as increases in the cost of leasing space in office buildings, retail shopping centers, etc.). So, businesses look for ways to reduce costs of doing business. When business relocations begin and vacancy rates increase, this is a clear indication that a crash in the property market is on the horizon. In the residential property markets, the end comes when property (i.e., land) prices become too high for first-time homebuyers to enter the market even with the exotic mortgage offerings provided by lenders. By 2004-2005, the capacity of millions of U.S. households to carry housing debt on top of other debt and expenses had reached its limit. Household incomes were stagnant or declining, household savings had disappeared for many, and interest rates were as low as they could go. To those dependent for their incomes on maintaining a high rate of property turnover, the temptation to engage in fraudulent practices was difficult to resist. It is too late to prevent the collapse, of course. At best, actions by governments around the globe have served to create an illusion of stability by injecting huge amounts of new credit into the financial system. Serious cracks in the system have developed on the European continent, serving to divert attention from the skyrocketing debt taken on by the United States government. The land market cycle will begin again when businesses see the opportunity to invest (to borrow and invest) in the expansion of their production facilities and begin to lease space in available buildings. As vacancy rates decline, the owners of quality buildings will quickly seek to convert rising demand into higher charges for space. Gradually, the asking price for land parcels will begin to climb and speculators will again be attracted to the land market in search of quick and above-market asset price gains. Even now, with land prices down in many markets, many investors (including foreign investors) with adequate cash reserves are acquiring land from financially distressed owners with no plans for development, waiting for land prices to recover to flip the property for what we allow to be treated as a “capital gain.” One of the real problems with our system of taxation with respect to the impact of the real economy (i.e., the production of goods) is the treatment of gains on financial transactions as more beneficial than income earned by producing goods or providing useful services. Actual capital goods depreciate in value over time and rarely sell at a price above initial cost. Among the numerous reforms we need is regulation that prohibits banks and any other financial institution that accepts government insured deposits or other guarantees from extending credit for the purchase and/or refinancing of land. This will require investors and homeowners to come up with cash down payments from savings or other sources that do not put the financial system at risk. Removing credit as the accelerant for land speculation will not solve the problem – this requires significant changes in how government raises its revenue — but it is an important first step. In summary, the only effective solution to the boom-to-bust nature of our economy is to tame the nation’s land markets. And the only effective means of taming our land markets are the measures I describe above. The question is whether our civic, business, labor and government leaders can come together to embrace and work for the changes we really need. MODERATOR: Welcome to this roundtable discussion on the subject of political economy. Our guests include some well-respected authorities on political economy and spokesmen for certain particular points of view where policies, prescriptions and issues are concerned. With us today are Robert L. Heilbroner, Adam Smith, Karl Marx, Henry George, Lester C. Thurow, John Maynard Keynes, Gunnar Myrdal, C. Lowell Harris, Arthur Laffer and (although he represents more of a political than economic perspective), former President of the United States, John Adams. I would like to begin our discussion by asking Professor Heilbroner to comment on what has been a very long and unsuccessful search for solutions he has himself termed “the Economic Problem.” Professor Heilbroner? ROBERT HEILBRONER: Thank you. As a starting point to this discussion, I would suggest to my colleagues that the trouble with economics is that it will not stand still. Issues change, ideas change, understanding changes. Even the past does not look exactly the same from one year to the next, and the present is apt to alter almost out of all recognition. MODERATOR: How, then, Professor Heilbroner, is one to approach the study of political economy in a manner which has a reasonable opportunity to produce understanding? ROBERT HEILBRONER: I would emphasize a broad understanding of economic history — not, of course, to learn names and dates, but to gain a sense of the evolution of the economic system, of the internal changes that have gradually altered the setting of economic life, and of the trajectory of economic evolution. MODERATOR: I believe any of your colleagues would agree about on the importance of understanding economic history. It strikes me that the first significant changes occurred during that time period when the last remnants of feudalism in the European-centered economy were losing ground to the merchants of the nation-states and “capitalism.” Economic historians have pointed to the 16th century for evidence of this process of change. Do you see this period, Professor Heilbroner, as a period of major change? ROBERT HEILBRONER: Yes, of course. Let me address for a moment these issues of historical change and the growth in the role of government. In antiquity and feudal times one could not easily separate the economic motivations or even the economic actions of the great mass of men from the normal round of existence itself. The peasant following his memorial ways was hardly conscious of acting according to “economic” motivations; indeed, he did not: he heeded the orders of his lord or the dictates of custom. Nor was the lord himself economically oriented. His interests were military or political or religious, and not basically oriented toward the idea of man or increase. The making of money was a tangential rather than a central concern of ancient or medieval existence. One further comment, if I may. An essential part of the evolution of the market society was thus not only the monetization of life but the mobilization of life — that is, the dissolution of ties of place and station which were the very cement of feudal existence. And this essential requirement of mobility lends to a further point. Mobility meant that any job or activity was now open to all comers. Competition appeared. Now any worker and any employer could be displaced form his task by a competitor who would do the job more cheaply. MODERATOR: Gentlemen, Professor Heilbroner has presented several rather direct statements concerning the development of political economy as an historical process. I’d like to first ask our Scottish colleague, Adam Smith, how his analysis of these historical processes compares with those of Professor Heilbroner. impulses and desires. Until human nature becomes perfect, such restraints are necessary; the problem is to keep them within the narrowest possible limits. MODERATOR: That problem, Professor Smith, has remained largely unresolved even to the present day. This argument over the proper role of the “state” in the political economy is one of crucial importance. Your ideas, Professor Smith lie at one end of the theoretical spectrum; at the other, perhaps, are those of Karl Marx. Herr Marx, how do you view the question of individual rights, the power of the state and what best responds to human nature? KARL MARX: Pardon me, please, if I bypass this question for the moment. I, too, would like to comment on the historical processes involved in the evolution of human society. I would simply add, here, that even when a society has got upon the right track for the discovery of the natural laws of its movement it can neither clear by bold leaps, nor remove by legal enactments, the obstacles offered by the successive phases of its normal development. But it can shorten and lessen the birth-pangs. MODERATOR: What you’ve done, I believe, Herr Marx, is to move our discussion into another area of historical disagreement where the study of political economy is concerned. You seem to have equated change with progress. One of your contemporaries, Mr. Henry George, attempted to distinguish between these two concepts. Mr. George, how would you react to Herr Marx on this issue? HENRY GEORGE: Time passes, changes occur, but has progress really resulted? By simple observation, I recognized that wealth had been greatly increased, and that the average of comfort, leisure, and refinement had been raised; however, it was true then and is true today that these gains are not general. The lowest class do not share in them. The tendency of what we call material progress is in nowise to improve the condition of the lowest class in the essentials of healthy, happy human life. The new forces, elevating in their nature though they be, do not act upon the social fabric from underneath, as was for a long time hoped and believed, but strike it at the middle. It is as though an immense wedge were being forced, not underneath society, but through society. Those who are above the point of separation are elevated, but those who are below are crushed down. MODERATOR: Does this imply, Mr. George, that like Karl Marx you also see the process ending in an inevitable struggle of one class against the other? HENRY GEORGE: With all due respect to Herr Marx and the large following he has secured, his analysis is materially flawed because he fails to properly distinguish between ownership “classes” which are productive, and therefore advance the progress of society, and those which are nonproductive. By its very nature ownership of capital must involve production in order to generate new wealth. Ownership of land, on the other hand, requires no such ownership activity, only the growth of the community. What Professor Heilbroner terms the “economic problem” can be largely solved by giving labor a free field and its full earnings; take for the benefit of the whole community that fund which the growth of the community creates, and want and the fear of want would be gone. The progress of science, the march of invention, the diffusion of knowledge, would bring their benefits to all. MODERATOR: So, in your opinion, Mr. George, the real struggle is not between labor and capital; rather, labor and capital are united in a bitter struggle against the landowners. Is that a fair restatement? HENRY GEORGE: Yes, I have no objection to your summary of my comments. I would, however, like to hear Herr Marx’s response. KARL MARX: Thank you. Viewed from the present, one cannot but marvel at the improvements in the conditions now experienced by a substantial number of workers in the capitalist societies. To what can be this credited? To the generosity of capitalists? To the productivity of labor? Or, perhaps, to the organization of labor into powerful political and economic voices? Long before the period of Modern Industry, cooperation and the concentration of the instruments of labor in the hands of a few, gave rise, to great, sudden, and forcible revolutions in the modes of production, and consequentially, in the conditions of existence, and the means of employment of the rural populations. I concede to Mr. George that this contest at first took place more between the large and the small landed proprietors, than between capital and wage-labor; on the other hand, when the laborers are displaced by the instruments of labor, by sheep, horses, etc., in this case force is directly resorted to in the first instance as the prelude to the industrial revolution. The laborers are first driven from the land. Land grabbing on a great scale is the first step in creating a field for the establishment of agriculture on a great scale. 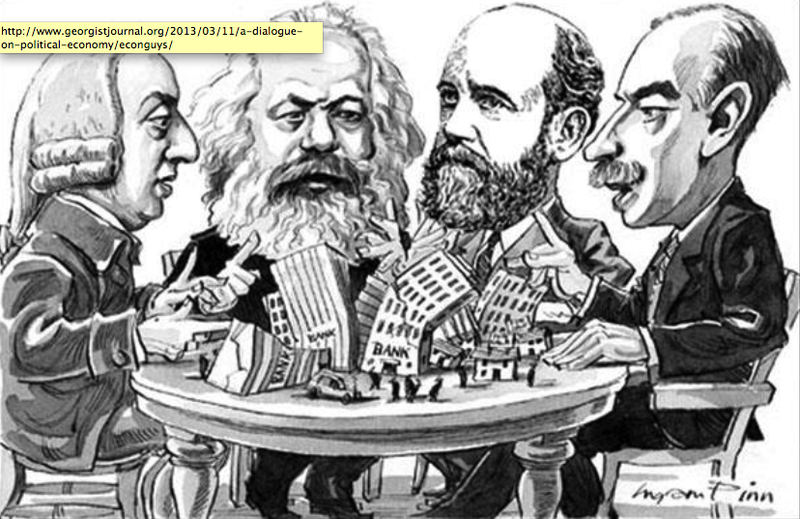 MODERATOR: What Mr. George seems to be saying, Herr Marx, is that the capitalist per se is not necessarily the culprit. Certainly, the motivations of the various competing groups during the sixteenth century were many — the struggle for power between the feudal lords and the monarchies, the conflict between Protestantism and the Pope, the formation of nation-states, the beginnings of colonialism — all played a role. JOHN MAYNARD KEYNES: Of course the capitalist, as such, is not the culprit — nor, in my view, is the landowner, as such. Mr. George and others may not agree, but one thing we must recognize is that under the system of “Laissez-faire” and an international gold standard such as was orthodox in the latter half of the nineteenth century, there was no means open to a government whereby to mitigate economic distress at home except through the competitive struggle for markets. Having said that, I certainly agree that the outstanding faults of the economic society in which we live are its failure to provide full employment and its arbitrary and inequitable distribution of wealth and incomes. However, it must be said that since the end of the nineteenth century significant progress towards the removal of the very great disparities of wealth and income has been achieved through the instrument of direct taxation — income tax and surtax and death duties — especially in Great Britain. MODERATOR: You see the intervention of government through taxes on income and wealth as an appropriate approach to the distribution problem, then, Lord Keynes? JOHN MAYNARD KEYNES: I strongly believe so. MODERATOR: Though there may be others, I suspect one member of our group in particular may strongly disagree, Professor Arthur Laffer of the University of California, and architect of what has come to be called “supply-side” economic theory. Professor Laffer, would you care to respond to Lord Keynes? ARTHUR LAFFER: To begin with, I strongly believe the demand side policies which had been applied in their entirety did not avert the economic collapse of the mid-1970s and in my view actually brought it about. The most damaged by the contraction were the disenfranchised members of society, including minorities, youths and the chronically disadvantaged. MODERATOR: If the demand management policies originally developed by Lord Keynes during the “Great Depression” are inappropriate, what will work? ARTHUR LAFFER: Basically, people don’t work to pay taxes but instead work to receive something after tax. Likewise, businesses don’t invest as a matter of social conscience but do so to make an after-tax return on their investments. It is axiomatic that when more of a good is produced its price falls. Tax rate reductions do lead to more production and if combined with a good monetary policy should reduce inflation. HENRY GEORGE: As to the question. of taxation, the mode of taxation is, in fact, quite as important as the amount. MODERATOR: Gentlemen, the reality of the world has been an absence among even the so-called “advanced” and industrialized societies of a political economy able to produce an adequate standard of living for all, Why do you think this is so? Yes — Professor Smith. ADAM SMITH: Far too few of those in our profession paid much attention to the lessons taught by history. In every instance, as soon as the land of any country has all become private property, the landlords, like all other men, love to reap where they never sowed, and demand a rent even for its natural produce. The man who cultivates the land must give up to the landlord a portion of what his labor collects or produces. This constitutes the rent of land which must be included in the price of most commodities. MODERATOR: What about those societies where private ownership of land has been eliminated, as in most of the communist-run societies? ADAM SMITH: I’m willing to address this point; however, I’d like to hear from someone here who actually had to face the issue of private property in land as a basic political issue such as President John Adams. JOHN ADAMS: I, too, believe that property in the soil is the natural foundation of power and authority. Three cases of soil ownership are supposable. First, if the prince own the land he will be absolute. All who cultivate the soil, holding it at this pleasure, must be subject to his will. Second, where the landed property is held by a few men the real power of the government will be in the hands of an aristocracy or nobility. Third, if the lands are held and owned by the people and prevented from drifting into one or a few hands, the true power will rest with the people, and that government will, essentially, be a Democracy, whatever it may be called. Under such a constitution the people will constitute the State. MODERATOR: The protection of property rights was an extremely important issue behind the conflict between the American colonies and its mother country, England. Why is the private accumulation of land such an important element in the classical perspective on political economy? HENRY GEORGE: The long-term effects are best illustrated by the constant existence of speculation where private ownership has been protected by the governing authority. Essentially, the influence of speculation in land is a great fact which cannot be ignored in any complete theory of the description of wealth in progressive countries. It is the force, evolved by material progress, which tends constantly to increase rent in a greater ratio than progress increases production, and thus constantly tends to reduce wages, not relatively, but absolutely. It is this expansive force which brings to new countries, seemingly long before their time, the social diseases of older countries. GUNNAR MYRDAL: Thank you very much, Mr. George. Findings in a study we did on Southeast Asia in the late l960s revealed there are other factors that, by keeping down the labor productivity, together are responsible for low average incomes and low standards of life. Very low living levels decrease the amount of labor input and also the intensity and efficiency of the work actually performed on the land by the labor force. Low incomes are only the other side of low labor productivity; a vicious cycle makes poverty and low levels of living, or low labor productivity; self-generating. Behind this unfortunate causal mechanism there is a social system of institutions and power relations, that is severely inimical to productivity, at the same time as low productivity establishes itself as the norm. And within this social system, both shaped by it and upholding it, are the ingrained attitudes of people in all classes. Among the non-physical factors that keep down labor productivity are also the primitive techniques employed in agriculture, likewise both a function of the existing social system, which deprives the tillers of both capital and incentives to greater effort, and a prop to that system. MODERATOR: That sounds very much like a prescription for social and political upheaval, which has certainly been the experience in Southeast Asia. Professor Heilbroner, can you add anything to Gunnar Myrdal’s statement? ROBERT HEILBRONER: In my view the prerequisite for economic progress for the underdeveloped countries today is not essentially different from what it was in Great Britain at the time of the industrial revolution, or what it was in Russia in 1917. To grow, an underdeveloped economy must build capital. MODERATOR: How important to capital building are these social and political factors discussed by both Gunnar Myrdal and Henry George? ROBERT HEILBRONER: Very important, obviously. How is a starving country to build capital when 80 percent of its people are scrabbling on the land for a bare subsistence? The crowding of peasants on the land has resulted in a diminution of agricultural productivity far below that of the advanced countries. Hence the abundance of peasants working in the fields obscures the fact that a smaller number of peasants, with little more capital could raise a total output just as large. By raising the productivity of the tillers of the soil, a work force can be made available for the building of roads and dams, while this “transfer” to capital building need not result in a diminution of agricultural output. MODERATOR: Is this a realistic approach to a solution, Professor Heilbroner, when there is so much political turmoil in most of these countries? ROBERT HEILBRONER: Understand that what I have outlined is not a formula for immediate action. In many underdeveloped lands, the countryside already crawls with unemployment, and to create overnight, a large and efficient farming operation would create an intolerable social situation. We should think of the process as a long-term blueprint which covers the course of development over many years. It shows us that the process of development takes the form of a huge internal migration from agricultural pursuits, where labor is wasted, to industrial and other pursuits, where it can yield a net contribution to the nation’s progress. MODERATOR: The problem I see in your statement is that even in the developed, industrialized capitalist economies unemployment and underemployment remain as major problems. And, government redistributive programs have not addressed the issue of creating productive employment opportunities. Not much time remains, but I would like to hear from Lester Thurow, whose book Zero Sum Society attempts to deal with this. Professor Thurow? LESTER THUROW: To have no government programs for redistributing income is simply to certify de facto that the existing market distribution of incomes is equitable. One way or another, we are forced to reveal our collective preferences about the “just” distribution of economic resources. As a result, one basic responsibility of government in a market economy is to create an equitable distribution of income and wealth if it has not been produced by the market. MODERATOR: What do you see as the role of the political economist in light of the increasing dependence upon government to achieve some degree of economic justice? LESTER THUROW: My feeling is that although modern economics springs from the search for a definition of economic justice, it has largely abandoned that search. Thus, nineteenth century economists, such as John Stuart Mill and our other historical colleagues, spent much of their time searching for the principles that would lead to a condition of equity. But by the 1940s, economists reluctantly came to the conclusion that there were no economic statements that could be made about equity. MODERATOR: Would you agree, Mr. George, with Lester Thurow’s conclusion that equity is inapplicable as an economic concept? HENRY GEORGE: I have written, and still believe, that the association of poverty with progress is the great enigma of our times. It is the central fact from which spring industrial, social, and political difficulties that perplex the world, and which statesmanship and philanthropy and education grapple in vain. From it come the clouds that overhang the future of the most progressive and self-reliant nations. So long as all the increased wealth which modern progress brings goes but to build up great fortunes, to increase the luxury and make sharper the contrast between the House of Have and the House of Want, progress is not real and cannot be permanent. To educate men who must be condemned to poverty, is but to make them restive; to pass on a state of most glaring social inequality and political institutions under which men are theoretically equal, is to stand a pyramid on its apex. Against temptations that thus appeal to the strongest impulses of our nature, the sanctions of law and the precepts of religion can effect but little; and the wonder is, not that men are so self-seeking, but that they are not much more so. That under present circumstances men are not more grasping, more unfaithful, more selfish than they are, proves the goodness and fruitfulness of human nature, the ceaseless flow of the perennial fountains from which its moral qualities are fed. The time for fixing every essential right on a legal basis is while our rulers are honest and ourselves united. From the conclusion of this war we shall be going down hill. It will not then be necessary to resort every movement to the people for support. They will be forgotten, therefore, and their rights disregarded. They will forget themselves, but in the sole faculty of making money. …The shackles, therefore, which shall not be knocked off at the conclusion of this war, will remain on us long, will be made heavier and heavier. When the frontier stage had ended, and society became stable, the chance to rise diminished. All the land worth owning was now occupied, and land prices rose, so that the sons of pioneers and the newcomers could not so easily improve their positions. Mobility therefore diminished as the community grew older. The established leaders in urban-industrialized America properly believed that their opponents would destroy them, or at least their functions, if they could, just as the protectors of the community accurately sensed the existence of a league of unrestrained power. …Both then assigned the enemy a monolithic consistency and machinelike organization, invested it with a conspiratorial design, and imputed to it an almost supernatural potency. Honors for distortion divided about equally. Let me not be misunderstood. I do not say that in the recognition of the equal and unalterable right of each human being to the natural elements from which life must be supported and wants satisfied, lies the solution of all social problems. I fully recognize the fact that even after we do this, much will remain to do. We might recognize the equal rights to land, and yet tyranny and spoliation be continued. But whatever else we do, so long as we fail to recognize the equal right to the elements of nature, nothing will avail to remedy that unnatural inequality in the distribution of wealth which is fraught with so much evil and danger. Reform as we may, until we make this fundamental reform our material progress can but tend to differentiate our people into the monstrously rich and the frightfully poor. Whatever be the increase of wealth, the masses will still be ground toward the point of bare subsistence — we must still have our great criminal classes, our paupers and our tramps, men and women driven to degradation and desperation from inability to make an honest living. Somehow, throughout it all, the human spirit remains ever resilient. Perhaps we will look again at the 19tb century, to its lessons and the ideas of its clearest thinkers, for a path which will take us into the 21st century absent the problems of poverty, mass unemployment and class conflict that now plague our civilization. 1. Henry George, Progress and Poverty (New York, 1879. Reprinted, Robert Schalkenbach Foundation, 1975) pp 11-12. 4. Cited in Fawn M. Brodie, Thomas Jefferson NY: W.W. Norton & Co., 1974) p. 156. 5. Cited in Allan W. Eckert, Gateway to Empire (Boston: Little, Brown & Co., 1983) p. 689. 7. Samuel Eliot Morison and Henry Steele Commager, The Growth of the American Republic (NY: Oxford University Press, 1962) p. 104. 8. Ibid. NOTE: That land hunger becomes a factor so early in American history was a clear warning of the developing class conflicts. Absentee landlordism sent millions of Irish to their graves and to America. “In that new world which had been called into being to redress the balance of the old there was to grow up a population among whom animosity to England was a creed, whose burning resentment could never be appeased, who, possessing the long memory of Ireland, could never forget. The Irish famine was to be paid for by England at a terrible price; out of it was born Irish America.” (Cecil Woodham-Smith, The Reason Why (NY: McGraw-Hill, 1953), p.136. 10. Douglas T. Miller, Jacksonian Aristocracy, (NY: Oxford University Press, 1967) p. 124. MASE GAFFNEY: One hazard that our present ways have created is the use of land value as collateral for bank loans, and the dependence of the money supply on bank loans. Our monetary theorists should go to work on that one – it is a big subject. FRED FOLDVARY: Some Austrian-school theorists are on the cutting edge of such studies. They show the faults of central banking and fiat money, and analyse the remedy, free banking (free-market banking with no central bank), and commodity-based money. STEPHEN ZARLENGA: Fred, those are assertions in praise of your fellow “Austrians,” but in my viewpoint, the only thing that such theorists are on the “cutting edge” of is a giant leap backward, and I give five reasons why, summarized in the George study, taken from Chapter 16 of my new book, The Lost Science of Money. ED DODSON: Mase is, in my opinion, exactly correct about the use of land value as collateral for bank loans. Bankers are frequently lulled into a false sense of security by the upward movement of land prices. This is a very serious problem, still, with regard to construction loans made to developers, when the banks rely on appraisals rather than a conservative forecast of cash flows coming from the property. After the last round of bank failures in the late 1980s, the regulators finally imposed some restriction on how much a bank could lend toward site acquisition (as I recall, it is 65% of the appraised value of the site, which still means that the risk is fairly high). In the realm of residential lending, private mortgage insurance companies take the top exposure to losses and the homeowner/mortgagor pays an annual premium to the insurance company. As the cash contribution requirements and reserves after closing requirements have been reduced, the premium charges have increased. At the same time, the use of sophisticated credit risk models fed by huge amounts of performance data have resulted in fewer and fewer losses associated with defaults. It should be said, however, that we have not endured a prolonged and deeply-penetrating recession here in the U.S., which would certainly test the stability of the finance system. FRED FOLDVARY: With free banking, private banks issue money substitutes in the form of paper notes or bank accounts, convertible into base money, and issued only to the extent that the public desires to hold such money substitutes. STEPHEN ZARLENGA: By this point Fred, you have gone against several of George’s major monetary positions including his continually stressed position to distinguish money from wealth; his pointed distinguishing of money from credit; his well informed condemnation of the “free banking” of his day; and his abhorrence of granting special privileges to bankers (or others). All these are part and parcel of what is called “free banking,” which is not to say that free banking has been properly defined. Your short description is fine to identify it in an email, and readers may believe that it is consistently defined in substantial detail elsewhere, but I have found (one of the 5 points) that the free bankers have not consistently defined either free banking, or money. ED DODSON: The key question of law is whether banks must hold or hold claim to whatever good or basket of goods is accepted as “money.” The strongest argument against banks of deposit holding precious metals is that this removes these precious metals from exchange and use in the production of goods. Precious metals are recognized and accepted globally as a storehouse of value; however, there is no reason why a bank of deposit could not acquire precious metals and then lend those precious metals out to producers, who would be contractually obligated to return the precious metals at some future date (plus a user charge). The collateral for the loan of this money could be other assets of equal value, an assignment of cash flows, or the assets of an insurance company that issues a policy to the borrower. What the law should not permit a bank of deposit to do is issue general obligation notes (i.e., uncollateralized debt) as a money substitute. When a bank of deposit makes a loan to a borrower, the bank is transferring the exchange value of a specific quantity of precious metals to the recipient. Subject to appropriate oversight by the insurance industry, by shareholder appointed auditors and by government regulators, there is no reason why there cannot be numerous banks of deposit operating safely and soundly under these conditions. This would constitute a system of private banking that eliminates the problem of the self-creation of credit (i.e., the printing of promissory notes backed by nothing in particular). FRED FOLDVARY: In my analysis, there is no way to reform central banking. It is inherently faulty and creates more instability than it cures. We need to replace it with free banking, which would include local currencies, LETS (local exchange trading systems), etc. STEPHEN ZARLENGA: It was for good reasons that we began moving away from free banking 175 years ago, and George gives a number of them as cited in the George paper. Henry George was pretty familiar with types of LETS plans – he even set one up in an emergency for his friend Tom Johnson. But he never viewed it as more than a temporary crisis remedy. On the other hand he did favor a centrally controlled monetary system, but emphatically, controlled by government not under private control. As my paper on Henry George’s Concept of Money notes, George was an informed and lifelong supporter of the Greenback system. “I’m a Greenbacker but not a fool!” he once remarked (citations in the study). ED DODSON: All around the globe today there are currency-starved communities. The situation is getting worse because less and less is produced locally that is exchanged locally. Thus, the currency or bank balance equivalent is not deposited in the same community in which purchases of goods are made. The purchasing power continually leaves these communities to be deposited into corporate accounts and distributed to executives and employees at some other part of the globe. LETS plans are critical alternatives that encourage local exchanges — keeping purchasing power circulation locally. I go further than Fred has in his comment above. The link between central banks and government treasury departments amounts to the legal authority to issue counterfeit money substitutes. When the U.S. Treasury issues bonds, the only legitimate source of investors ought to be holders of currency and/or bank balances that are fully backed by some basket of commodities or precious metals. The situation today is that if Alan Greenspan believes that printing more Federal Reserve Notes to give to the U.S. Treasury in exchange for bonds will not cause too much of a depreciation in the exchange value of these Federal Reserve Notes, there is nothing to prevent the Fed from doing so. FRED FOLDVARY: The three great economic reforms need to be the public collection of rent, free trade, and free banking. STEPHEN ZARLENGA: George (and I) would certainly say YES to one (pub. col. of rent); perhaps NO to two (free trade), if you mean it the way I think you do, but that would depend largely on your clarifications; and emphatically NO to three. Again there is a substantial discussion of the free trade aspect of Georgism in the study, that some Georgists may dispute, and others will agree with. There is also a suggestion therein on resolving those differences and the particular responsibility that now falls on those calling for “free trade”, the first being to better define it. Just slapping a label “free” on something has worked for a long time in gaining knee-jerk, unthinking support for it. No more. ED DODSON: George was certainly clear that without the public collection of rent, removing barriers to exchange (i.e., “free trade”) would not work to solve the unjust and inequitable distribution of wealth. FRED FOLDVARY: Unfortunately, some Georgists do not believe in true free trade in money and banking. They think that centralized planning works in money where it failed in everything else, and that the fiat wizards have the wisdom to correctly forecast many months into the future. They also don’t understand what interest is and how it relates to capital and money, and why it is so important to have a market-set rate of interest, not manipulated by central bankers. As the kids say, we need to “keep it real”. STEPHEN ZARLENGA: It is not so much a question of what “some Georgists” believe, but of what Henry George himself thought. The fact that we are still talking and writing about him over 110 years after his death demonstrates that his thinking obviously struck deep chords in humanity. He is what has brought us together on these email lists, and therefore his ideas, especially when deeply held, should not be so easily cast aside. They deserve much closer examination. And yes we agree – real is good. CHUCK METALITZ: I’ve been trying to follow these monetary discussions, and I hope Ed or Fred can clarify one thing for me: Under a free banking system, how does the government decide which currency(ies) to accept for taxes? ED DODSON: I know that Fred has responded, but I have not yet read any of the subsequent exchanges. Government can, of course, pass legislation requiring that taxes be paid in the paper currency of one or more banks of deposit. Based on what backs the bank’s currency, the market would establish exchange rates just as now occurs between paper currencies of differing central banks. There is nothing to prevent the Federal government from establishing a government-owned bank of deposit, issuing its own paper currency backed by quantities of the precious metal it already holds, then spend that currency into circulation. It would be interesting to see how many people would cash in the Federal currency and deposit their precious metal payment with one of the privately-owned banks of deposit. The banks would all be competing with one another over how safe and sound and transparent they are. CHUCK METALITZ: Under a free banking system, how does the government decide which currency(ies) to accept for taxes? FRED FOLDVARY: Under free banking, the government does not establish or privilege any currency. Taxes are accepted in whatever currencies circulate or can be reasonably converted to what commonly circulates. The government provides a tax credit for any reasonable conversion costs. For example, an American living in Europe would be ableto pay taxes in euros. It is a simple matter for the government to either have a euro account or let the taxpayer credit the conversion cost. “Reasonable” means the taxpayer uses an available commonly circulating currency and does not deliberately use an inconvenient non-money medium. JOHN KROMKOWSKI: Ed, Thanks for the thoughtful essay. A couple of questions: You wrote about a proposal under which: “The enabling legislation should require that deposit banks maintain adequate insurance to protect investors . . ..” With what would the harmed investors be compensated? Normal government issued money or other non-bankrupt private money (also insured)? In the end, wouldn’t the government need to serve as the insurer of last resort? And if so, why bother with adding the additional layers? ED DODSON: Ed here: Our history is that government becomes the insurer of last resort when private insurers determine that the risks are too great to insure or that premiums adequate to cover the anticipate losses are not affordable to the parties to be insured (i.e., flood insurance for homeowners in flood plains, hurricane zones, etc.). In a system where banks of deposit are the creators of currency in circulation and account balances against which exchanges are made, there would have to be a catastrophic system failure to bring down the system. Insurers today and under a new monetary system would still need to meet minimum financial reserve and capital ratios to continue to take on new business — to be declared financially sound by auditors. Because every bit of currency would be backed by some specific quantity of goods (or, under a local system, potentially by labor hours) the only serious risks are fraud, counterfeiting and embezzlement. I do not downplay these risks; protecting against them are costs of doing business, and the banks of deposit must charge fees high enough to cover the costs of prevention. The insurance carrier would certainly not keep all of its deposits in one bank. Moreover, insurance companies sell portions of their risks to other investors. As for whether the Federal government needs to be the insurer of last resort (as with deposit insurance), there is an argument that insuring depositors balances up to $100,000 has given bankers too much latitude to extend credit to very marginal borrowers, such as foreign governments. Take away some of this deposit protection and people will deposit their money only with banks that have the highest financial ratings by independent rating agencies. JOHN KROMKOWSKI: There have also over the years been experiments with private money in the US: script and Internet credits, how do those fit in the history and what can we learn. ED DODSON: Right. We use currency for purchases made in smaller and smaller currency denominations. Debit cards could be mandated for exchanges by members of the same bank of deposit (or affiliated bnaks of the deposit) so there would be no float advantage between the time of exchange and time of actual payment. This would eliminate losses for bad debts, lower net costs of doing business and bring down prices without squeezing profit margins. JOHN KROMKOWSKI: Finally, I am certainly not up to date or at all knowledgeable about the money question. I mostly don’t see what the problem really is. It seem more theoretical and potential (although potential grave), but nonetheless theoretical and potential with an increasingly low probability of meltdown in developed countries. ED DODSON: Well, every day you hold currency balances in a bank today you are losing purchasing power because the central bank and the government treasury very neatly spend more currency into circulation by the exchange of central bank notes for government debt instruments. The danger, historically, is that this process of the self creation of credit destroys the purchasing power of those who have currency denominated savings as a primary form of their personal or business assets. The system rewards debtors and penalizes creditors, as well. I temporarily transfer $100 of my purchasing power to someone via a loan and charge that someone 5% per annum for the use of my asset. At the end of a year I receive $105 in currency back, but in the meantime the government and central bank have expanded the supply of currency in circulation, price of goods and services have adjusted upward, and now I need to use $105 in currency to secure in exchange what $95 in currency would a year ago. Thanks to the government I have been robbed. HARRY POLLARD: Ed, as you know, it seems evident to me that there is a chasm between whatever is used as a measure of value and what is used as an exchange media. What is best for one is generally bad for the other. Purchasing media is in major fashion created on the spot by credit cards or check book. It does the job well, doubling or halving in quantity as needed by the exigencies of the market. As you may know, I don’t think much of “velocity of circulation”. ED DODSON: My main thought on this whole subject is based on my perspective of history and of the extent to which corruption permeates our socio-political arrangements and institutions. No private person or entity can honestly self-create credit. Others must extend credit. STEPHEN ZARLENGA: Yes If you mean “private entity”, such as a privately owned central or other bank, But further EDJ, and HP, its important to distinguish here between credit and money. Private people can always create credit, and that is usually their business (there can be exceptions). The real problem arises when the credit they create is MONETIZED, through special legal privilege, as the banks have; and that is then all of our business, because that monetized credit they create and control has value because it can draw on the entire workings of society. As I read the Free Banking advocates (they are not all consistent) some of them want to continue that anti-social process in their operations. Did you notice that while you thought you and Fred Foldvary were on the same wavelength regarding free banking, in fact Fred never answered this very pointed pivotal question. The main reason that private banknotes were accepted by Americans through much of our history, was that the notes were accepted by government in payment of fees. That served to monetize them. It is well documented. (Tom Jefferson also pointed out another reason – that there was little else circulating in the new nation, and the people had little choice) When that power to use the bank notes was largely removed by Jackson and Van Buren, state bank note circulation collapsed. That brought on the depression of the late 1830s – worst one in our history till then. Bad and corrupt as the privately issued banknotes were, they still functioned as A substitute money, and Van Buren, with a commodity outlook on money, did not understand (at first) the need to put government money (i.e. real money) in their place. Being of Dutch background, he opted more for a Bank of Amsterdam model instead of a Bank of England model in his Independent Treasury System. ED DODSON: …… (i.e., temporarily transfer their purchasing power — either for free or at below-market rates of return because of some philanthropical or societal objective they support, or at a market rate of return because that is what the market will bear. Governments, on the other hand, have enacted laws under the guise of monetary reform and economic stability that enable them to self-create credit. They are legally permitted to issue debt in exchange for central bank currency. Those same laws allow the central bank to simply print more bank notes without producing anything tangible as collateral for the bank notes. If the monetary authorities are very lucky, all of the rest of the world’s governments and central banks will be playing the same game with less discipline, the increase in the amount of government spending attached to the currency balance acquired from the central bank will not drive up prices (i.e., destroy the purchasing power of the quantity of currency and credit already held prior to the expansion). Even if the government wins, in the short term, Harry, this is still a process of government-orchestrated theft of property. Is that a power we think is just, that we want government to possess? I hope not. HARRY POLLARD: However, important to every kind of purchasing media is the measure of value that provides the unit of account. All my transactions in Vegas were made in terms of a “dollar” that is supposed to be worth about the same day after day. ED DODSON: The key phrase is “supposed to be”. You trust that the government and the central bank will not do something out of expediency that will have the effect to taking away your hard earned (all that labor sitting at the gambling table or slot machines) purchasing power — more likely, the gambling casinos purchasing power just acquired from your gambling activity. Why should we be dependent on the [historically absent] integrity of government officials to act in the interest of the citizenry. History puts me on the side of Max Hirsch, as I quoted in my response to Stephen Zarlenga. HARRY POLLARD: The “exchange medium” function of money is taken care of without a problem, yet most of the present discussion is about various exchange media. It seems like endless talk about something that is well in hand. I must say that a “local” currency doesn’t appeal much to me. If using it locally will get me a 15% discount off local prices, I might use it. ED DODSON: Well, Harry, you are fortunate to live in an area where the legal tender economy brings as much currency in as departs to the multinational corporate providers of most goods and services. There are many rural communities in the U.S. and elsewhere in which a local currency, backed by something tangible everyone understands and trusts will be provided under an enforceable contract, is a significant means of generating exchange at a level well above barter. STEPHEN ZARLENGA: Ed points out a real problem here, which living in upstate New York hits home on a daily basis. The money is flowing to the major money market areas. This is a problem that needs to be addressed. However to stop the dispensation of monetary justice from above, its going to require addressing that problem at that level, at some point. I consider that a first priority. HARRY POLLARD: I prefer gold, or whatever commodity is picked by the free market as the best for the job. I have no idea why some people don’t trust the market. It’s a confluence of the free opinions of people. It’s where people’s democratic opinions about things are measured not in the fashion of the bloodless opinion polls, but by action and exchange. (Compare: “Do you believe in educational vouchers?” with laying out $39.99 for an electronic back scratcher.) I dislike ‘market baskets’. I don’t like government calculations setting a ‘value’. Again, I want those specifically concerned in exchanges deciding for themselves what is the best unit. ED DODSON: The reason I have advocated a basket of commodities to back currency is that a basket of goods is less vulnerable to shocks. The old saying, “don’t put all your eggs in one basket” applies. A basket of precious metals — gold, silver and platinum — for example, historically has a more stable aggregate value than any one of the metals alone. This does not mean a bank of deposit could not issue currency backed by insured, enforceable contractual obligations to deliver a quantity of oil or coal or natural gas, or timber, etc. etc. ; but, the volatility of global prices for these commodities is greater individually than collectively. STEPHEN ZARLENGA:. Again, Henry George got this one right over 100 years ago. He implored his readers to make the distinction between money and wealth (Especially in “Social Problems”). Commodities are a form of wealth. Money is an abstract power. This correct concept of money view goes back much farther than Henry George. We see it also in Aristotle, when he wrote that “Money exists not by nature but by law.” (from Nicomachean Ethics), as discussed in Chapter 1. When you say to “back a currency” you are eliminating the money aspect of it. When the pretense of “backing” was made, with gold and silver; banknotes were convertible on the one condition that not a lot of people asked for redemption. They were really banker’s credits improperly monetized and accepted for taxes. That’s what gave them value, not the gold and silver that the banks didn’t have. Because the metals were often/ usually never really there, depending on time and region. That is clear historically. Hope my intrusion has not been too disorderly. DAN SULLIVAN: For example, if one were to use wheat dollars, one would be in continual jeopardy of my tax obligations rising, should the value of gold rise relative to the value of wheat. FRED FOLDVARY: In practice, in almost all places, a free banking system would evolve into one common unit of account within an economy, because this is what is most convenient, and also because free banking would evolve from the current system, which uses U.S. dollars. So in practice, the problem of privileging a currency with tax payments would be very unlikely. The market would have already moved towards a common currency. But suppose that there are two currencies commonly circulating, gold dollars and wheat dollars. Each is redeemable into fixed amounts of the commodity. The currencies fluctuate relative to one another. Suppose the government required that taxes be paid only in wheat dollars. The effect would not be much different than if all the food sellers required payment in wheat dollars, or all the sellers and renters of real estate required wheat dollars. If people spend more on food and housing than on taxes, the government effect would be less than the private effect. But in free banking, government should not privilege any commonly circulating currency. If there are more than one commonly circulating currencies, government would base the tax liability on a neutral value, such as a set of commodities. For example, the set could be an ounce of gold plus 10 ounces of silver plus 100 bushels of wheat plus etc., or possibly a basket of commonly circulating currencies, similar to the SDR unit used by the IMF, and adopted also by some countries such as Latvia. The basket of commodities and/or currencies would be chosen so that it has little seasonal fluctuation. The wheat or gold dollar value of taxes would be computed based on this standard, and people could pay with either dollars. DAN SULLIVAN: In either case, all holders of currency that do not directly meet the government’s standard are placed in jeopardy, and this reality makes “free banking” an oxymoron. FRED FOLDVARY: I don’t see how that applies to a neutral commodity standard. DAN SULLIVAN: Thus, if there were to be a commodity-backed currency (which I am not recommending), then gold and other scarce resources would be the worst commodities to use as backing. FRED FOLDVARY: In free banking, each individual person would be free to decide which currency he wishes to transact with and use for savings. Free banking is not a government standard but the opposite, the absence of any dictated standard. If fiat money serves people best, that is what would circulate. Indeed, free banking would begin with a frozen stock of government fiat money, and then evolve from that according to what works best. We should not confuse a gold standard with free banking. HARRY POLLARD: As a general rule it’s better to have economic control of the economy rather than political control. But, economic control means price mechanism control – the free market. ED DODSON: How does one separate the two, Harry? And, do you know of any instances in history or the contemporary world where government, heavily influenced by those at the top of the economic ladder, has not intervened to significantly prevent the operation of (in Henry George’s terms) “a fair field with no favors”? Without just law there can be no free market. HARRY POLLARD: We both agree that our Georgist society shall run under the general rule of “Liberty and Justice for all” where Liberty is ‘Freedom under the Law’, and Justice is when the Law applies equally to everyone. These can be expanded a little, but the general thought I think is clear. (It should be noted that “Privilege” is the exact opposite of “Justice”.) The problem with the market is that it leads to decisions that some don’t like. When the village has 12 pubs and one church, obviously something is wrong, so a law is passed providing one pub for every church. There again, you get a much higher income than me – so you should give some of your wealth to me. That’s fair, that’s just, isn’t it? Well, it’s political control of the economy and we’re agin it. HARRY POLLARD: The “Free Market” is the best way to produce the biggest pie. “Free Land” is the best way to distribute the pie. “Free Banking” is the best way to handle the bits of paper that makes exchange easier. Poor banks will not do well in the Free Banking shakedown process. Good banks will build up goodwill and a reputation for honesty and good management. Good banks will probably take over the failing banks (government is not needed for this). ED DODSON: Now you’re making sense. However, some degree of government oversight and reguation is needed. Insurance companies and shareholders must commit to hiring auditors to make sure the managers do not cook the books. And, there need to be strong penalties imposed on those who succumb to embezzlement, fraud, or other crimes of theft. HARRY POLLARD: I’m easy. However, I get the feeling that shareholders (or their representatives) should take care of their own affairs. When, as with ENRON, the auditing company is in the fix, there is a problem – but crooks have been around forever. Best way to deal with them is with economic control of the economy. When privilege has been kicked out, corporations will not become so complicated and unwieldy – a condition found everywhere in a politically managed economy. I like Leonard Read’s “Do as you wish, but harm no-one.” Penalties should strike those who harm someone. HARRY POLLARD: Fractional reserve restrictions aren’t needed. I would expect that banks will range from 100% to 1% reserve. The interest you’ll earn will range from a safe low interest to a high less safe interest. Pay yer money and take yer choice. Obviously, banks will publicize their reserve policies. ED DODSON: As I have written earlier, safety and soundness require reserves when a financial institution engages in lending its assets to others with the expectation of repayment. By definition a bank of deposit is an entity that holds tangible assets (or contractual obligations against others to deliver such tangible assets) for all currency issued. A lending institution can only lend what it has in assets, and then only that portion of assets consistent with its cash flow needs. HARRY POLLARD: There must be science of banking. A good bank needs to keep enough reserves to cover expected needs. If it doesn’t keep enough, it will have to borrow from another bank that could be costlier than covering themselves properly. So they will act wisely. After that, they can obligate themselves to pay as much as they wish. This is how they earn their profit. Isn’t that what fractional reserve is all about? HARRY POLLARD: Banks would issue Purchasing Media as they wish. (Banks don’t create “money” unless you are whimsical in your meaning of money.) The point about most Purchasing Media is that it is easily created and destroyed. The credit card slip you write today will be invalidated in a day or two. ED DODSON: You’ve lost me a bit, Harry. I agree that commercial and savings banks do not create purchasing power. They can only transfer their own purchasing power to another party. The Fed and the U.S. Treasury exchange IOUs as the means of allowing the U.S. Government to self-create credit and use that credit to purchase goods and services. It is your last point that I do not follow. When I use a credit card to make a purchase, within a short period of time my account is charged and the vendor’s account is credited. If I am receiving “interest” on my account balance, I benefit from float for the day or two my account is not charged even though I have received the goods or services. The global economy works with elaborate mechanisms to maximise and minimize float; one could argue that pricing equilibriums automatically adjust to account for float. In any event, once my bank account is charged and the vendor’s account credited, the purchasing power shifts but does not disappear. HARRY POLLARD: Actually my float can be 25 days. I use credit cards for everything — even relatively small purchases. Each month, on the last possible day, the accounts are paid in full automatically from my bank. Pricing will cover any cost of floats. The purchasing medium is created by you and me. It’s the paper we imprint with our cards and sign. It goes wherever and is stamped or otherwise cancelled as the amount is transferred to our tab. Same with checks which are purchasing media that after submission are stamped or otherwise cancelled after transfer of funds whereupon they are returned to us – no longer purchasing media. That’s what I mean by easy creation and destruction of purchasing media. We dare not have a measure of value that can be so easily created and destroyed. Of course the point I’m making is that the functions so easily attached to “money” — measure of value and medium of exchange – cannot easily be placed on one thing. They are contradictory functions. Finding one thing to satisfy both functions is a Chines puzzle and is responsible for most of the confusion that accompanies the subject. ED DODSON: The key question of law is whether banks must hold or hold claim to whatever good or basket of goods is accepted as “money.” The strongest argument against banks of deposit holding precious metals is that this removes these precious metals from exchange and use in the production of goods. STEPHEN ZARLENGA: Ed, it does not occur to you that you are embracing an extremely primitive concept of money, which George understood to be harmful. I strongly maintain that if Georgists would pay serious attention to what Henry George writes about the distinction between money and wealth, that such errors could be avoided (this is clear in my George paper at http://www.monetary.org/ lostscienceofmoney. ED DODSON: Of course, this is a basis for debate. As I have explained in my review of your work, we come away from our examination of history with two very different conclusions of how to solve the problem. STEPHEN ZARLENGA: Before you can develop a meaningful “free banking” proposition, Ed, you need to have a valid concept of money. You are starting with a false one, resulting from the “relapse to metallism” put over by Adam Smith as discussed in Chapter 12. Henry George knew better! ED DODSON: I offer precious metals as the transitional medium, not as an ending point. I see no reason why the system cannot function with other commodities backing currencies or even labor units. The system blossoms on the basis of interconnected contractual obligations — again, with appropriate auditing and insurance safeguards built in. STEPHEN ZARLENGA: After money is properly defined, then if you want to call it a free banking “movement,” you need to have that money concept be consistent among the advocates. It is not. ED DODSON: Precious metals are recognized and accepted globally as a storehouse of value; however, there is no reason why a bank of deposit could not acquire precious metals and then lend those precious metals out to producers, who would be contractually obligated to return the precious metals at some future date (plus a user charge). The collateral for the loan of this money could be other assets of equal value, an assignment of cash flows, or the assets of an insurance company that issues a policy to the borrower. What the law should not permit a bank of deposit to do is issue general obligation notes (i.e., uncollateralized debt) as a money substitute. When a bank of deposit makes a loan to a borrower, the bank is transferring the exchange value of a specific quantity of precious metals to the recipient. Subject to appropriate oversight by the insurance industry, by shareholder-appointed auditors and by government regulators, there is no reason why there cannot be numerous banks of deposit operating safely and soundly under these conditions. This would constitute a system of private banking that eliminates the problem of the self-creation of credit (i.e., the printing of promissory notes backed by nothing in particular). STEPHEN ZARLENGA: Are you sure, Ed, that Fred it not advocating the “self-creation of credit” to be used as money? (You see such privately created fiat money is something that I also consider it imperative to eliminate; and Henry George did too, throughout his lifetime) but that is not at all clear from Fred’s brief description. If we could all agree on that, it would be a major step forward. ED DODSON: The self-creation of credit requires the ability to enforce acceptance (i.e., coercion). Few private parties possess this ability. Governments, on the other hand… I will let Fred respond to your concern over how to prevent fraud and misrepresentation. STEPHEN ZARLENGA: If you read by George paper carefully (George’s attacks on the banking system) or the chapters of my book on American Monetary History), you should understand that Fred’s description of free banking is essentially the manner under which banks operated in America for much of the 19th century. Thus, my comment that the only cutting edge the Austrains are near (when they are not cutting onions) is a giant leap backward. ED DODSON: All around the globe today there are currency-starved communities. The situation is getting worse because less and less is produced locally that is exchanged locally. Thus, the currency or bank balance equivalent is not deposited in the same community in which purchases of goods are made. The purchasing power continually leaves these communities to be deposited into corporate accounts and distributed to executives and employees at some other part of the globe. LETS plans are critical alternatives that encourage local exchanges — keeping purchase power circulating locally. STEPHEN ZARLENGA: Yes, the world is starved for money, but that is thanks to a privately-owned and privately-controlled central bank – the solutions which I consider essential, focus on ending such banking privilege and placing it in the hands of the citizenry through the treasury. By the way that was also George’s conclusion, even before the Fed existed. Read more George! ED DODSON: Jeff Smith’s “citizens dividend” is the core solution to ensuring that all citizens have a baseline of wealth ownership. People must have the means to produce and exchange goods for goods and for services with other members of the same economy if money is to remain in that economy. The case for local currencies backed by locally-produced goods and services is made by the tendency of existing socio-political arrangements and institutions to generate what we have — hundreds of billionaires and billions of propertyless and poverty-striken people. STEPHEN ZARLENGA: Among the problems I have with “LETS” are that they can’t stop the monetary injustice from above, and they could draw away the attention of reform minded persons. ED DODSON: The LETS idea is part of a broader concept of community based on decentralist (i.e, self-sufficiency) principles. Multinational corporations with global production systems have not demonstrated any concern for what happens to communities when they come in, exploit resources, exploit workers, pollute the environment, support corrupt political regimes — all in the name of profit maximization. LETS is an element of a value system based on cooperative relationships. 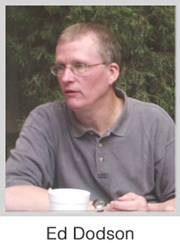 Ed Dodson is a long-time member of the Henry George School’s faculty. Since his retirement in 2005 from Fannie Mae, where he held various management and analyst positions in the Housing & Community Development group, he has lectured and taught courses at the Osher Lifelong Learning Institute in Philadelphia. Beginning in the Fall of 2014 he joined the faculty of the Learning Is For Everyone program at Burlington County College in New Jersey. He also serves as Senior Researcher with the Henry George Historical Center in Philadelphia. Ed is a graduate of Shippensburg and Temple Universities in Pennsylvania. Since 1997 he has directed the online education and research project called the School of Cooperative Individualism. He is author of the three-volume work, “The Discovery of First Principles” and is a contributor to several publications promoting the perspectives of Henry George.